Germany will continue to provide support to Ukraine, in particular through a variety of cooperation programmes, German Chancellor Angela Merkel said at a news conference with President Petro Poroshenko in Kyiv. "We will significantly increase the amount of money allocated to cooperation," she said. Germany is planning to help Ukraine establish an excellence centre worth 2m euros. According to Merkel, it is important that scientists have an opportunity to stay and work in Ukraine, not move abroad. She said Germany was prepared to allocate an additional 85m euros to improve employment and accommodation prospects for young Ukrainians through vocational training. 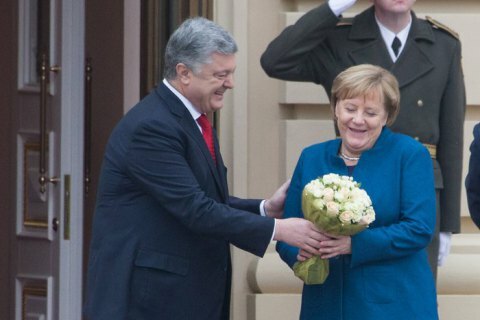 Merkel sees progress in the negotiations on bilateral agreements, in particular on 500m euros untied loan, which can be used for implementation of the infrastructure projects in Mariupol, Zaporizhzhya and at the Odesa port. She recalled that since 2014, Berlin has allocated 490m euros, including for the needs of temporarily displaced persons and the development of social infrastructure in eastern Ukraine.